Former President Goodluck Jonathan yesterday visited former military president, Gen. Ibrahim Babangida (retd) and former Head of State, Gen. Abdulsalami Abubakar (retd), at their Hilltop homes in Minna, Niger State. 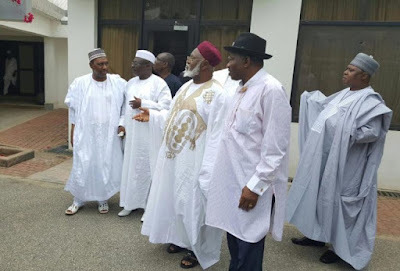 Jonathan’s first stop was at Babangida’s residence and he spent about one hour with the ex- military ruler before proceeding to Abubakar’s residence. He was accompanied on the trip by a former Minister of State for Finance, Bashir Yuguda and his former Chief of Staff, Chief Mike Okhiadome. Babangida and Jonathan met behind closed door for about 40 minutes at IBB’s private living room and the ex-President left the place for Abubakar’s residence few minutes later.